Pre-production collectors often attempt to assemble prototype series encompassing as many stages of the production process as possible. Achieving a figural run containing numerous key pre-production pieces can be an extremely daunting task. Non-existing pieces or pieces locked in other collection frequently hinder such an endeavor. Phillip Johnson has certainly risen to the challenge by assembling this impressive figural run for the Power of the Force A-wing Pilot 3 3/4" action figure. 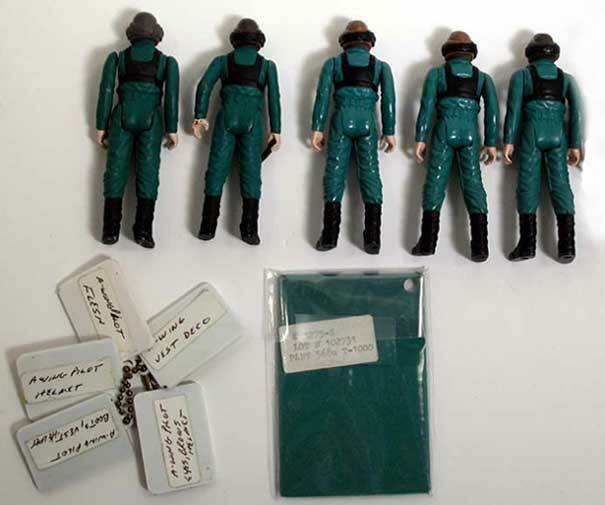 From left to right, the run includes: hand painted hardcopy paintmaster with paint swatches, hand painted protomolded figure, undated first shot plastic master with plastic swatch, undated first shot with darker colored torso, and the production figure. Above we see a rear view of the pre-production series. Notice the back of each paint swatch features a label containing pertinent information correlating each color type to certain areas of the figure. The single photo above shows a close-up shot of the hand painted protomolded figure. Astute eyes will notice the protomolded figure possesses Luke Poncho arms painted in the A-wing Pilot arm color scheme. This figure likely served as a display/photography sample. As a result, the incorrect limbs were not problematic for its use. As someone who focuses intently and actively searches for matching prototypes for two characters series, I can truly appreciate the time and effort Phillip put forth to assemble a pre-production series of this magnitude. 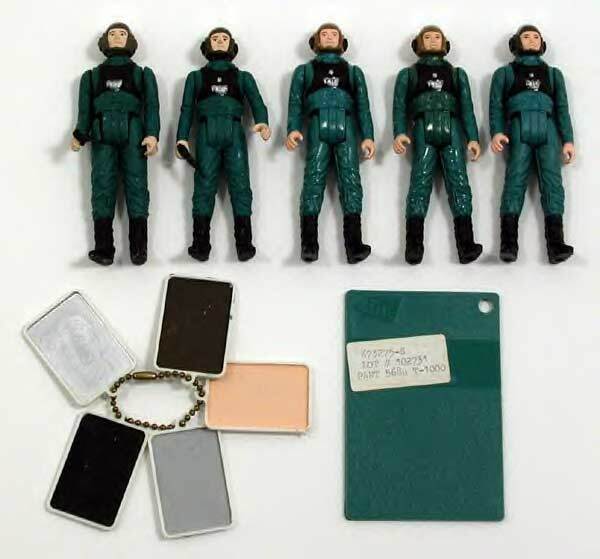 The run certainly serves as an inspiration for character collectors seeking out complimentary pre-production items for inclusion in their character collections.